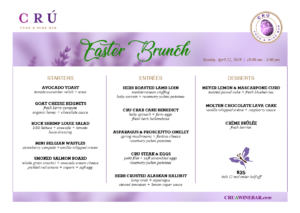 Hop on over to CRU for Easter Brunch and celebrate Spring with a scrumptious 3 course wine country menu! and full. Extra bonus: they serve $3 mimosas, bellinis, ciprianis! Don’t risk long lines or restaurants that don’t take reservations; call CRÚ today!